Fall signals the start of the holidays and of fun-filled days with family and friends, from costume parties to hearty Thanksgiving dinners. But before you get into the merry-making mood, it pays to note that fall is also the perfect time to have new windows installed. In this article, Renewal by Andersen ® of St. Louis explains why fall makes the perfect time to order those gorgeous replacement windows you’ve been eyeing for the past few months. While you have so many beautiful replacement window options to choose from, you would want to choose bay and bow windows as part of your home remodeling in St. Louis, MO. This way, you can have a built-in place to display your holiday decorations. You can also transform the space into a sitting area or a reading nook on normal days by simply adding cushions and pillows. Ask the experts at Renewal by Andersen of St. Louis to help you decide what kind of windows in St. Louis can give you a spectacular, panoramic view of the seasonal changes. Seeing the season change through crystal-clear doors is the next best thing to experiencing it for real. Given the moderate temperatures in fall, there is no better time to schedule your installation. Without the scorching heat of the sun or heavy rainfall, our technicians can get your windows up and working with no delays. The evening breeze is starting to get cooler—is your home prepared for the months to come? 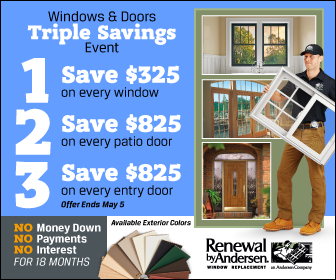 Let Renewal by Andersen ® of St. Louis help you prepare for them by installing energy-efficient replacement windows. Made with Fibrex material and High Performance™ Low-E4 glass, your new windows are 56% more energy efficient in winter compared to old, ordinary dual panel glass windows. Give us a call today at (314) 332-2364 so we can start preparing your home for the fall season.